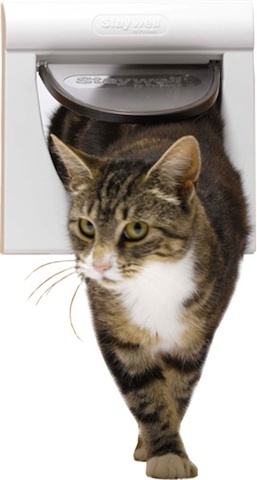 Deluxe 4-Way Locking Cat Flap is available in gleaming white finish. Gives you control by allowing you to set the flap for : In only, Out only, Fully locked , Fully unlocked. Flap has a solid transparent flap with magnetic seal for improved energy efficiency. Suitable for fitting into doors, walls or glass. Depth can be extended by using 1-7/8" Staywell 310 Tunnel Extensions. Overall Size - 9-1/4" x 9-3/4"
Cut Out Size - 6-1/2" x 6-3/4"
Maximum Shoulder Width - 5-7/8"